Identifying Nutrition Requirements deals with measuring the available nutrients in the ground and in the vines. The following link leads to a good general presentation on grapevine nutrition: http://www.uvm.edu/~fruit/grapes/gr_horticulture/GrapevineNutrition.pdf . Our past and current approach to nutrition management is still very dilettante. We irrigate when the plants look stressed. We send soil and plant samples to third-party laboratories to test for nutrition deficiencies, but we are not yet confident how to interpret the results and take corrective action. We amend the soil with fertilizers, and we spray nutrients onto the leaves based on recommendations from consultants and experienced vineyard managers. Irrigation systems are complex and fragile. They require a fair amount of upkeep because of earth movements and erosion, interference from animals, general wear and tear and evolving technologies. There is a never-ending effort to use less water and be more efficient. In our region, the bulk of the necessary water comes from the rain in the winter and is stored in the clay soils. Our long-term goal is to supply each vine with the estimated amount of water it needs without wasting any in evaporation from the vineyard floor or underground drainage. As each plant sits in slightly different soils, has different exposure to sun and wind and varies in size and maturity – the ideal solution is to measure each plant’s requirement in near real-time and regulate the supply accordingly. This is not yet economically feasible but should be achieved within the next 10 years at an investment of less than $10 per vine. In the meantime, we estimate the demand and regulate the supply manually by vineyard block. As a general rule, mature vineyards need little irrigation. The vines’ root system should reach deep enough to get to the required moisture. Excess irrigation of mature vineyards prevents the roots from growing deep and makes the grapes watery. Irrigation is needed for the first 3 years after planting to help the young vines with shallow roots survive the summer heat – that is the principal reason for the drip irrigation system built into the trellis. We irrigate the vineyard a few days before extreme heat-waves when temperatures are expected to exceed 95 F for more than a day. This assumes we get good weather forecasts and can supply the plant ahead of time with extra water reserve. This happens a few times a year. We irrigate the vineyard in the final days of berry maturation when we detect an imbalance between sugar levels and phenolic maturity of the grapes. In unusually warm years the sugars accumulate faster, and the maturity of the skins and seeds may lag behind. In this instance, intermittent irrigation during the last weeks before picking allows to grapes to mature fully and prevents premature shrivelling and keeps the sugar levels in check. We irrigate new replacement vines for the first 3 years every 1-2 weeks. This has to be done plant by plant. We used to use 5-gallon buckets which have a 1/16th-inch hole at the bottom, so they release water only very slowly. The buckets were placed next to each young vine and manually filled by a hose. The picture shows the setup. Since it is time-consuming to refill the buckets by hose every week, we added a second irrigation line controlled to only provide water to the new plants. That line is on a timer for automatic irrigation. Visual inspection: looking for visual clues signalling nutritional deficiencies or excesses. Experienced farmers and vineyard managers can look at a plant and identify nutritional deficiencies. Typical clues are the abnormal colouration of leaves or stunted growth. Every 3 years or so, we test the soils for their nutrient and trace metals .We take about a dozen soil samples 3 to 12 inches from the surface in each block and mail them to a testing laboratory. Testing laboratories provide good instructions on how to take the samples and how to send them in. A week later we get the results by email. 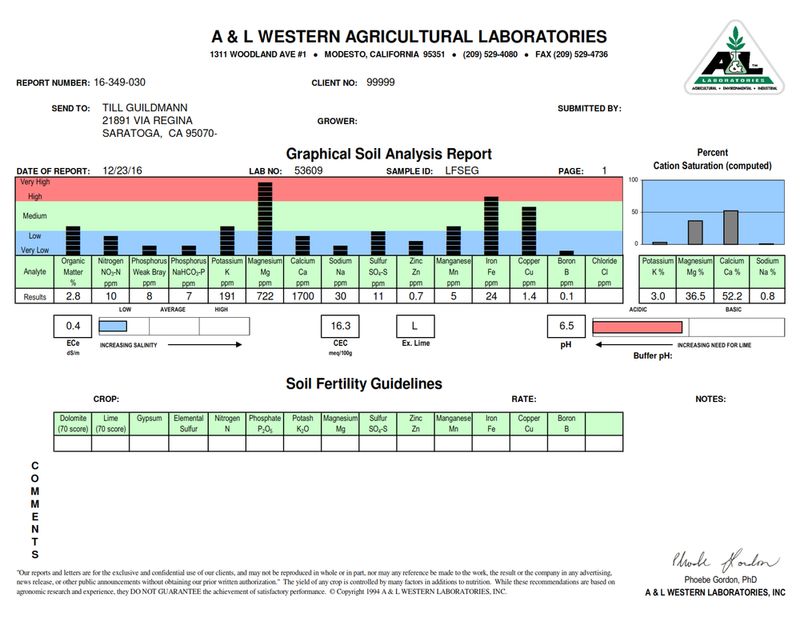 Following is a typical soil test report. Testing soils is easy, interpreting the results and taking appropriate action is far more difficult. Each soil type has vastly different characteristics for water and chemical extraction. The challenge is to understand how the plant’s roots interact with which types of soil under different humidity and temperature conditions. Furthermore, the soil characteristics can vary greatly even over short distances. To complicate things even further, fertilizers take the better part of a season to sink into the ground and distribute, and the plants take another year or two to extract and react fully. We have used an excellent consultant (http://www.growyoursoil.org) to interpret soil tests prior to planting when we added significant amounts of soil amendments to pastures (see Soil Analysis & Amendments on the Site Preparation page). The difficulties in interpreting soil analysis results and correcting with fertilizers have led to an alternative approach: analyse the plant tissues instead. We collect around 50 petioles (stems of leaves) from plants in each block and mail them to a testing laboratory. Following is a sample of a resulting plant analysis report. We then correct the shortages of nutrients in the tissue by spraying chemicals directly onto the leaves — not a very natural remedy, but quicker and more effective. For the primary nutrients (Nitrogen, Phosphorus and Potassium), foliar sprays are only a band-aid, for micronutrients (iron, zinc, boron, manganese) they are preferred application method. The primary nutrients (N, P and K) can be sourced from inorganic (usually mined) or organic materials (collected on farms). Inorganic materials such as gypsum (Calcium Sulfate), or lime (Calcium Oxide) release the nutrients faster than organic materials such as compost or manure. So, the challenge is not only to understand how much of which component needs to be added but also how long does it take until that component can be absorbed by plants at what growth stage before it is washed away, evaporates or disappears otherwise. Note, excessive addition of Nitrogen ends up in the groundwater and is a significant source of pollution (see https://www.cdfa.ca.gov/Is/ffldrs/frep/pdfs/GrapeBrochureWeb.pdf for a good summary on nitrogen application in vineyards). Another good source of general information is the International Plant Nutrition Institute (http://www.ipni.net/ ). The best summaries of fertilizers and soil amendments I have come across are from the University of Maryland https://extension.umd.edu//sites/extension.umd.edu/files/_images/programs/hgic/Publications/HG42_Soil_Amendments_and_Fertilizers.pdf and the Colorado State University: http://extension.colostate.edu/topic-areas/yard-garden/choosing-a-soil-amendment/ . Clearly, there is much room for improvement. Eleanor’s VF-11 (Nitrogen 0.15%, Phosphate 0.85%, Soluble Potash 0.55%): general plant food for foliar feeding. LIG-Calcium+B: Calcium Lignosulfate: Foliar Nutrient to add Calcium & Boron. to promote flowering and even fruit set , increases fungal resistance. The REVIEW: NutrientTests”-layout shows the results from soil and foliar tests over time for a given Harvest Block.